I think we could be sisters too!!! Seriously, a very special gift!! Wow Terri, what a lovely gift, I am sure your sister will just love this. What a wonderful sister you are. Thanks for sharing. Oh, honey, she will like it - NO, she will LOVE it. You are so fantastic! What a wonderful sister you must be. This is lovely. I got a brother no sis - but many girlfriends who qualify! hugs, sweetie. STUNNING bracelet, Terri! I, too, love hearts and flowers so this just says HAPPY BIRTHDAY! I know she'll love it ~ because it's from you. Your new studio must have wonderful muse's floating about, because you are creating some precious art! I Can't Wait to Wear It!!!!! I LOVE IT TER!!!! Terri, it is absolutely gorgeous. I am sure your sister will love it. How sweet of you to make her somethig from the heart. Your sister will be in Seventh Heaven. The bracelet is GORGEOUS. I am in awe of anyone who can create such stunning work. Take a bow! I just love the jewels...nice work! Wow Terri! 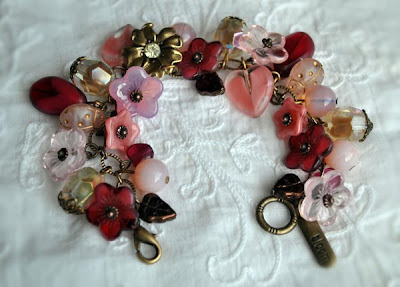 I love, love , love this bracelet! I think your sister would like it a lot! Beautiful bracelet, Terri, lucky sister, she will certainly treasure your gift I'm sure! Thank you for leaving kind comments on my blog! HAPPY BIRTHDAY TO YOU. hAPPy bIRTHday TO YOU. Happy Birthday, dear TeRrI, happy birthday to you! : ) xoxo and hugs for my special bud! How Beautiful! I am so glad I found your blog!